Three years ago, the tragedy at Sandy Hook Elementary school happened. 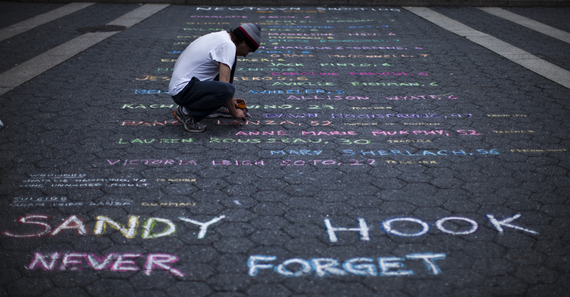 The carnage and inhumanity at Sandy Hook has become so commonplace in American culture. Talk of gun control has remained talk even in the wake of knowledge that terrorists have purchased guns due to our lack of gun control. Three years later and I am tired and dare I say becoming desensitized. You would think that after the loss of so many children there would be an outcry. Unfortunately, it seems the loudest voices are conspiracy theorists claiming it was staged and stalking victims' families. I am tired of the mass shootings and politicians who feign condolence yet take no action to prevent it from occurring again. Three years ago, I wrote the blog post below. Unfortunately, the only thing that has changed is my response. I cannot watch another mass massacre or a video of a citizen shot in cold blood by those who are supposed to serve and protect. I cannot stomach it. Have we learned nothing from Sandy Hook? My heart and prayers go out to the victims, survivors, responders, and everyone involved at Sandy Hook Elementary School. It is a week before Christmas and this happens. I am nostalgic this time of year, but this happens and you are reminded that we do not live in an age of innocence. I was shocked and horrified when I saw the news that someone shot up an elementary school. When the news broke on the internet, I did not contact my mother. A few hours later she sent me a text, "Did you hear the news?" I told her that I knew. I never speak of my eldest sibling, my only brother. I was his shadow. I emulated his every move. He died while playing at the beach from an accident at a Fourth of July celebration with family and friends. He was only 7 years old, the only son, and my best friend. I recall my aunts crying. I remember telling one aunt, "Don't worry, he promised me he'd never leave me so he'll be okay." Childlike faith is something powerful. Even at the burial, I remember thinking, "It's okay. He said he wouldn't leave me." After his death I became withdrawn. Had I done something wrong that my brother was taken from me? I heard old folks say God was a jealous God. Was God punishing me because I worshipped my brother? You may think this is silly, but I was four years old when my brother died. I felt that if I trusted or loved as hard as I loved my brother, that person would be taken from me. When my paternal grandmother died four years later, a week after my birthday, I was convinced something was wrong with me. My mother had no idea what I suffered. She knew I was withdrawn. Every time she asked me what was wrong, I said nothing or would not confide in her. She did not know how to reach me. I was a child and none of this made sense to me. I learned early on that what you love is not always guaranteed to stay. Back then, you did not send your child to therapy or grief counseling, you just coped. My four year old imagination did not serve me well in coping with the loss of my brother. I recall how my brother's death affected both my father and mother. My mom, already protective, became even the more overprotective. She did not want to go to beach that day and look what happened. For years, my parents never spoke of my brother until my first nephew was born. I remember my mom saying, "The worse thing in the world is for a parent to bury their child." That statement came to mind as I read the news on the internet about Sandy Hook School. How would the victims' parents cope at this time of the year? How would the parents of the surviving students explain to their children why what happened took place? They would face questions worse than I did as a four year old grieving the loss of her brother. Newtown reminds us that we are part of a larger family. We are touched by the tragedy that happens next door, down the street, around the corner, in another state, or the world at large. My holiday centers around my nieces and nephews. They are my babies. I cannot imagine what the parents of survivors are going through, nor can I fathom what the victims' parents are experiencing. I do not think my heart can handle the vividness of that reality. God bless and comfort the residents of Newtown CT.
As we pray and send condolences to the students, teachers, administrators, and parents of Sandy Hook Elementary School, please remember to kiss the ones you love, especially your children. Remind them that even when they do things that are disappointing, that does not diminish your love for them. Stevie Wonder's These Three Words states it best.